We know our Daughter wants to swim and we really think that she can do it but we still make her wear her Kitties(Arm floats) I'm just a little to nervous of her drowning you know you look away at the wrong time and they go under..... my Son did it too many times to me So we signed her up for lessons at Leahi Swim school that's where we took our son. So my Daughter lucks out and she gets one on one swim lessons the other kids seems to be very scared of the water someone forgot to check with the kid to see if he wanted to go to swim lessons. So the teacher tells Bella to do a certain stroke in the pool and she does it like 3 times then decides to do whatever kind of swimming she wants to do. LOL So the instructor tells her come on Bella we need to do this first then we can have free swim. But she doesn't listen but after she did a month of lessons she NOW can swim WITHOUT floats Bella!!! and these days I'd do anything to get a few bites in her mouth. I can't believe My Baby is Three years old Now me not being much of a girly girl I never thought I'd be able to put together a girl party but with the help of my Best Friend I did it! First I had this Fabulous Family vacation already planned at a five star hotel that we were leaving on a few weeks later. So my Husband had me on a major budget So I had to work really hard. We have a small townhouse So I knew I wanted it to be just a few kids so I invited 5 of her closest friends. 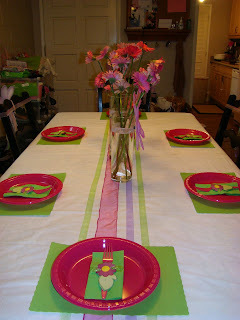 Lyndsea helped me make a really cute table setting with ribbon a flat white sheet flower vases. I had a simple menu pizza's made with English muffins Mickey Mouse chicken nuggets Cheese and Crackers Veggie and dip and A few activity stations Play doh, bubble, plastic horseshoes. 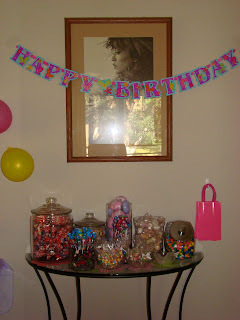 And my favorite part was My candy Bar It came out really nice. the kids loved it. I love the Simple things in life. I love them like they are mine!! First soccer game of the Season. this season he has Sage on his team and their coach is Sages Dad. at the end of their season they had more loses then wins. But it was a learn experiencing for them winning is not everything!! Our friend Sailor turn 4!! But in between the party Bella went in the car to cool off it was a very hot day! It was a nice family day for the Tanaka Family! !